The Alameda County Office of Education's Core Learning Department, in partnership with Google CS4HS, is offering a new 8-month program to train secondary teachers to deliver the brand new Advanced Placement Computer Science Principles course. This is a great opportunity for educators interested in expanding not only their own skills, but the career and college pathways for their students in this new digital age. What are AP CS Principles? 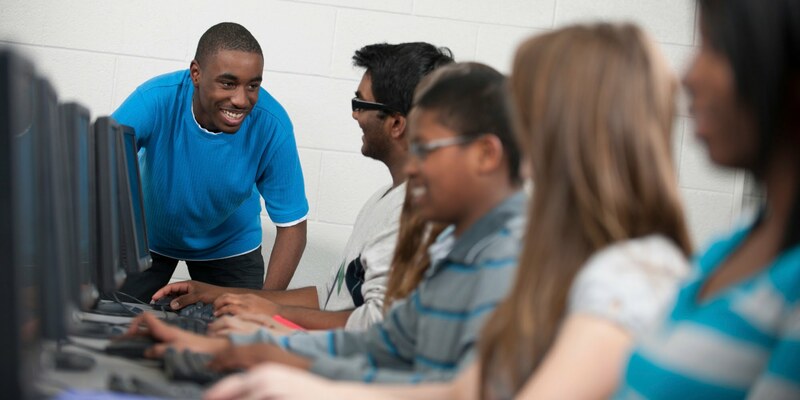 AP Computer Science Principles was designed to be a more inclusive course designed to introduce a wider range of students into the world of computer science. It was born out of a need to offer a rigorous course that highlighted the creative aspects of computer science that were lacking in the traditional Advanced Placement CS course. It is also designed to make CS more relevant, focusing on connections between computers and society, as well as algorithms, data, and abstraction. Learn more about the AP CS Principles here. Teachers in Alameda County are invited to be part of a community of practice that will support and develop each other's computer science capacity and work together to find meaningful and engaging integration of the computer science principles into your practice. It is intended both to prepare teachers to start teaching AP CS Principles, as well as to prepare them to infuse their own content area lessons with computer science principles and concepts. Teachers who participate are not expected to have any prior computer science, or programming experience, however, general computer proficiency and curiosity in the field of CS is required. Teachers are expected to share the lessons and experiences teaching CS Principles with others, online and through participation in the cohort, with the aim of scaling these practices beyond our cohort and county. Answers to specific questions regarding eligibility, course offerings, schedules and more can be found in the FAQs page. CSP4T will meet once a month between August and February of 2016. We will offer a stipend of $800 to teachers who attend a minimum number of sessions, complete the course assignments, and participate in the community of practice. There will be an online learning component to the course, and all participants are expected to collaborate online and share lessons and experiences with the cohort. Workshops will be held at The Alameda County Office of Education, 313 W. Winton Ave. Hayward, CA 94544. Interested teachers should apply through our Google Form. California, despite being the home to Silicon Valley, offers relatively few computers science courses, including the AP CS courses. In 2013 less than 20% of high schools offered a computer science course. Overall that year, less than 1% of California students took the AP Computer Science test. The numbers are even more staggering when considering demographic data for those who took and passed the course. It is the aim of CSP4T to make computer science more accessible to students in Alameda County, and beyond. By sharing our lessons and experiences integrating CS Principles, we hope more teachers will see the importance and value of offering computer science to their students. "How can I apply computer science principles to my English course?" The answer might not be obvious, nor should it be. It does not have to be an unnatural combination, as it may first appear to be. The framework of CS principles lends itself to a multi-disciplinary approach.